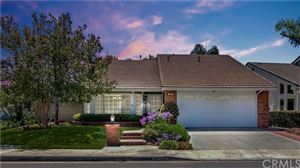 Bright, open and welcoming, this executive class home in Robinson Ranch/Trabuco Highlands community showcases a host of upgraded living spaces poised to enrich your lifestyle. A double door entry door and front porch veranda lends a friendly ambiance to the residence, which features soaring ceilings over the foyer, living room and dining room with floor to ceiling windows that complement the living room & majestic curved dining room with a view to the outdoors. 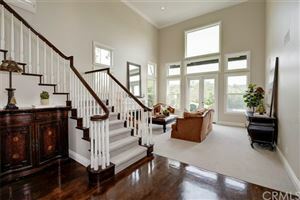 Elegant base molding accentuates the handsome hardwood flooring. The open family room flows effortlessly to an updated traditional style kitchen with contemporary favorites such as white cabinetry, granite countertops, an island with storage, large pantry, new stainless steel appliances. The residence presents 4 bedrooms and 2.5 baths, including main-floor bathroom and laundry room with sink. An extra-wide staircase leads to volume ceilings that embellish a stylish master suite with sitting area and view, fireplace, walk-in closet, separate soaking tub and walk in shower. The sunset views enrich a backyard that is primed for entertaining complete with impressive stack stone built-in BBQ and bar, plenty of seating for guest and cozy fire pit. Don’t let this one pass you by! The Robinson Ranch Community offers award winning public & private schools, Olympic size pool, spa, sports courts, hiking & bike trails and parks. Close to Tijeras Creek Golf Course, RSM lake & outstanding local dining. Low tax base, NO MELLO ROOS! We respect your online privacy and will never spam you. By submitting this form with your telephone number you are consenting for Bullock Russell Real Estate Services to contact you even if your name is on a Federal or State "Do not call List".